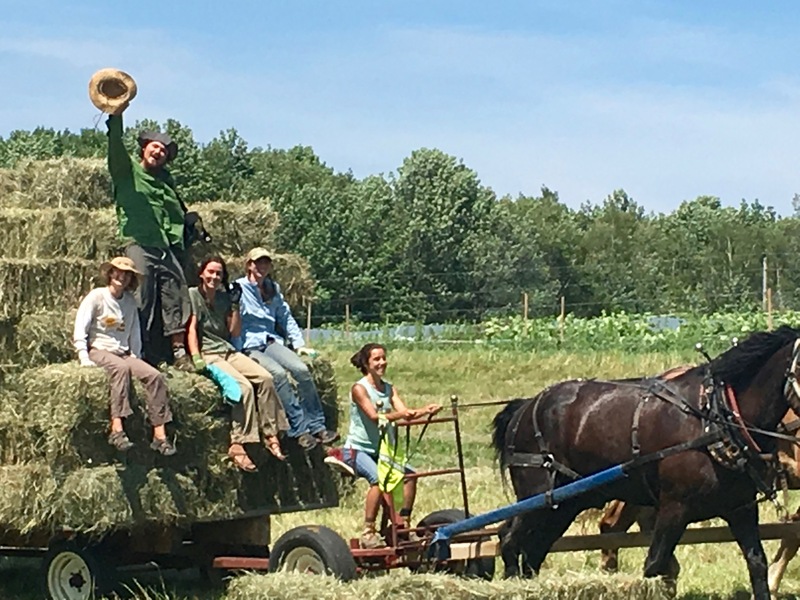 Although we are a horse-powered farm, human power is the truly at the heart of the day to day work! Our farm crews is the center of our farm community and not only do they lend us their backs; their positive attitudes, satisfaction in seeing a job well done, and passion for farming are what make it all work! 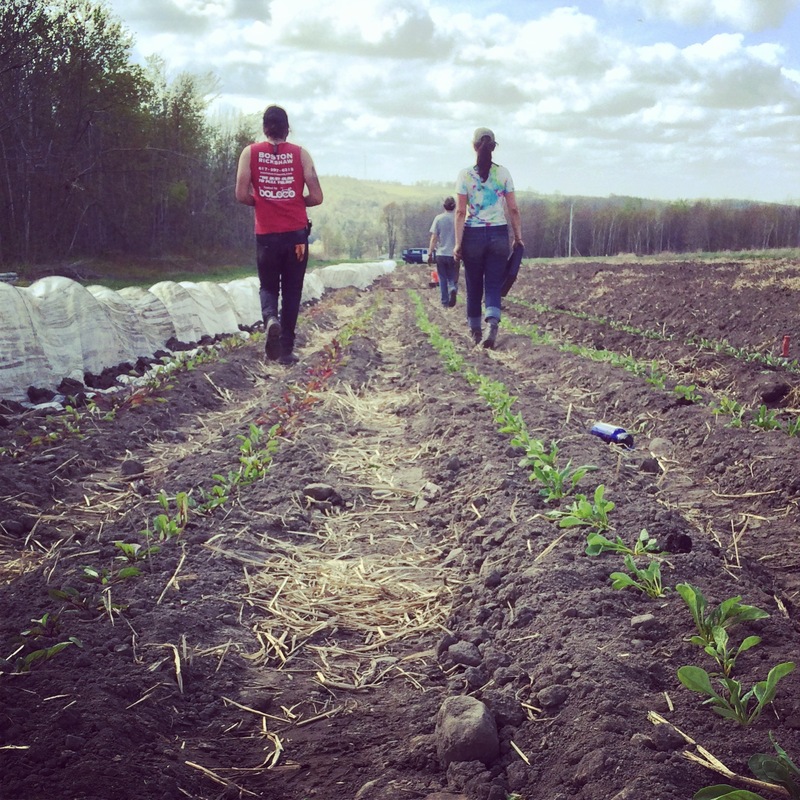 Our farm scale affords for folks who work here to participate in a wide variety of tasks throughout the farming season, while being asked to focus and specialize in certain aspects of the day to day of the farm. The farm is managed by owners Adrienne and Ken and they are deeply involved in the daily needs of the farm. Most days one of us is working side by side with the crew while also needing to take individual time to manage other aspects of the farm business throughout the week. 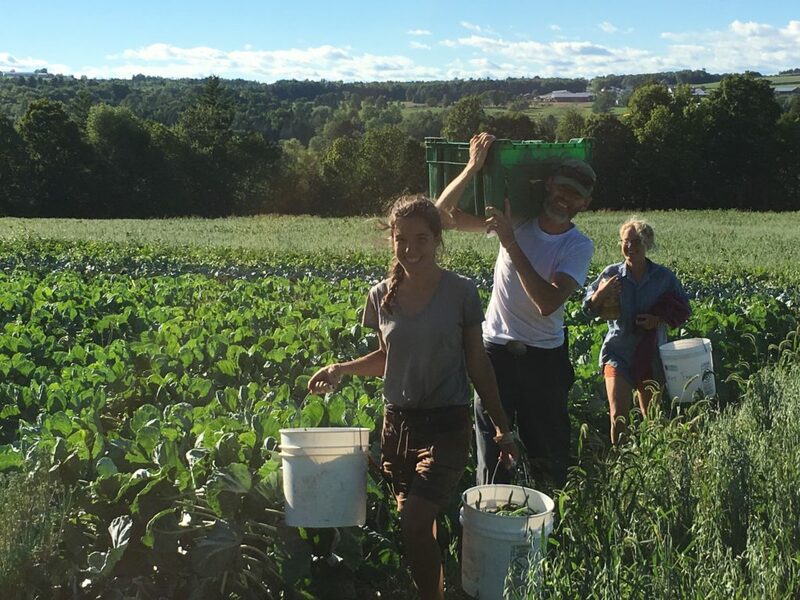 New Beat Farm’s crew members are hard working, self motivated individuals , who are passionate about organic agriculture, love to have their hands in the soil, excited to learn new things and thrive in a fun, fast paced collaborate work environment. They help the farmers in executing the daily needs on the farm while keeping in mind the bigger picture of the season. They will be involved in all aspects of the farm and will receive in depth training in our farm systems to give them the confidence and knowledge they need to be valuable members of our farm family. Everyone on our crew is important to the success of our farm and are expected to take responsibility for their work, listen carefully to direction and driven to get the job done. They are able to work well in groups as well as have the confidence to work productively on their own. Work on the farm is diverse and is at a scale where our workers take part in a variety of aspects of the farm. building and repairing farm infrastructure. Crew members will also be given independent work projects based their abilities, interest and farm needs throughout the season that could include, succession seeding in the fields and greenhouses, high tunnel management, irrigation management, and individual crop management. Our work varies seasonally and has weekly patterns. Mondays and Thursdays we are mostly bustling about harvesting for our variety of markets. Tuesdays, Wednesdays, Fridays are project focused days, planting, weeding, seeding etc. We mostly work as a crew but there will be times throughout the week when you will be asked to work efficiently and productively alone. There is a one hour (unpaid) lunch break in the middle of the day, where you are welcome to cook your meals in the farm house. Once a week we all get together and Adrienne and Ken cook a farm lunch for the crew. We want our workers to enjoy the fruits of their labor and they are welcome to the abundance of second quality veggies we harvest. We value balance in both our own lives and those of our crew and are committed to keeping our work hours to our scheduled time. With the exception of days when we are bringing in hay we try to make sure everyone leaves on time. We accomplish this by showing up ready to work on time, being effective, efficient workers who can prioritize tasks, know how to transition quickly from one project to the next, and enjoy the challenge of getting the job done on time. 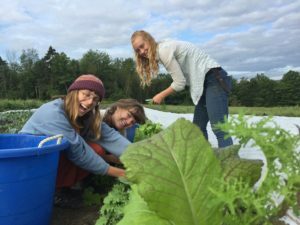 Pay commensurate with prior work experience starting at $11/hr to $12.5/hour for full season workers, plus veggies from the farm. We have a limited amount of rustic on farms housing available for modest rent, otherwise we will use our community network to help you find housing within 15 miles of the farm. Please email us your resume with relevant employment history, 3 references, as well as a cover letter describing why you want to work at New Beat and how your past experiences make you a qualified candidate for the job. Email us at newbeatfarm@gmail.com. Thank you!